Homegrown calabrese has a taste! 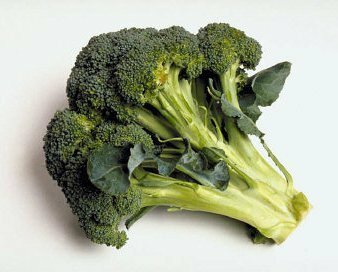 Calabrese is also sometimes called Italian broccoli or green sprouting broccoli, but it is a different type, and requires different treatment to produce good results. It's also much quicker to get a crop from calabrese - and the difference in taste between the home grown and the virtually tasteless stuff you get in shops is amazing - there's absolutely no comparison. Purple and white sprouting varieties of broccoli are deal with on a separate page. All heading varieties are dealt with on the page on cauliflower. Calabrese does not like root disturbance, so unlike other types of broccoli, it should be sown direct 2.5-5cm (1-2") deep in rows 30cm (12") apart. When the seedlings come up, thin to 15cm (6") apart in the row. Calabrese can be sown successionally from late March to early July. Early spring crops may be produced by sowing an early variety in modules in late August or early September. Transplant to a cold frame or greenhouse (or outdoors in mild areas) and harvest February to April. Water seedlings daily in dry weather. Hoe to keep weed free. Mulch to conserve moisture and suppress weeds. Catch crops may be sown between rows early on, eg. radishes, lettuces, seedling salad crops. Crop covers such as fleece should be used at the latest once the crop is 5cm (2") tall, if aphids or caterpillars are to be avoided. Do not assume that because a pest was not a problem the previous year, it will not become one this time. Water up to 4 gallons per sq yard per week in dry weather. Harvest maincrop from June until the plants are killed by frost. A topdressing with blood, fish and bone or growmore 100% organic after cutting the central spear encourages the development of side shoots. Mealy aphids and caterpillars are the most troublesome pests. Pollen beetles may also be a nuisance. Crop covers should prevent access.